"HUMAN CREATURES DRAG THEMSELVES ALONG IN THE SNOW"
The largest wave of so-called death marches began with the evacuation of almost 60,000 prisoners from Auschwitz-Birkenau in mid-January 1945. One of them was Raizl Kibel. In a frost, half-barefoot, or entirely barefoot, with light rags upon their emaciated and exhausted bodies, tens of thousands of human creatures drag themselves along in the snow. Only the great, strong striving for life, and the light of imminent liberation, keep them on their feet. But woe is to them whose physical strength abandons them. They are shot on the spot. 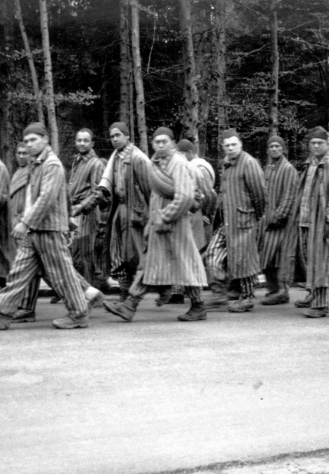 In such a way were thousands who had endured camp life up to the last minute murdered, a moment before liberation. Even today I still cannot understand with what sort of strength and how I was able to endure the ‘death march’ and drag myself to Ravensbrück camp, and from there, after resting a week, or two, to Neustadt. Thousands of people died on the death marches as a result of starvation, exhaustion, exposure to the freezing cold, and, as this extract suggests, the brutality of the guards.